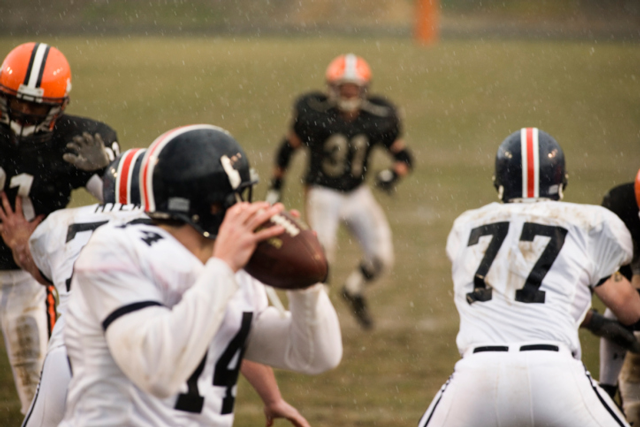 Whether you’re gearing up to watch your favorite team play in the big game or are just tossing the pigskin out in your backyard, nothing can ruin your football fun like a quarterback infected with the influenza virus. If that quarterback is you or someone you care about, get into FastMed Urgent Care for flu treatment. And if you haven’t had a flu shot yet, get yours for just $20. And now, let’s get to the gridiron. Here are some signs your quarterback might have the flu. 1. He takes a knee at inappropriate times. Fatigue is a symptom of the flu. People with the flu should be resting, not playing in a gloriously violent sporting contest. 2. For once in his career, his head aches from something other than a concussion. Headaches are another flu symptom. Not even the strongest helmet can protect you from the flu virus. 3. He expresses a strong preference for the sack. As in, he’s tired and wants to go to bed. Again, get some rest if you have the flu. Consider watching one of the Netflix comedies that are perfect to stream from your couch on your sick day. Sore throat: another flu symptom. It can also be a symptom of strep throat. Your FastMed Urgent Care healthcare professional has rapid tests for both flu and strep. 5. The red zone he’s most concerned with is on his thermometer. 6. He’s got an emergency packet of Kleenex taped inside his helmet. Another flu symptom is nasal congestion or a runny nose. That can be a real distraction from the running game. 7. All of the cheerleaders also have the flu. The flu is contagious! According to the Centers for Disease Control and Prevention, “[m]ost experts think that flu viruses are spread mainly by droplets made when people with flu cough, sneeze or talk.” If you’re sick with the flu, don’t come into work. But do go to your local FastMed Urgent Care. It’s a health touchdown!